The author is a professor who has done research on four doctors of the church in the Catholic faith. These women were declared doctors because of the lives they lead at the time in history. I enjoyed this book for it's historical, theological, and personal view of each saint. St. Teresa of Avila, St. Catherine of Sienna, St. Therese the flower are among the doctors mentioned in this biographical synopsis. The author condensed a lot of information in this treasure. I bought this book because I wanted one place to refer to 4 fabulous women (Doctors of the Church) who are of great interest to me and who, as the title refers "shaped Christianity".This is easy and quick to read, yet you will want to go back to it time and again.Great Bibliography and Notes.Highly Recommended. This was a good read. 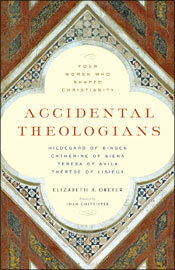 It has a good overview of the four female doctors of the church.